(Nanowerk Spotlight) Metal nanoparticle catalysts have been widely employed in large-volume catalytic applications such as Haber-Bosch process for implementation of nitrogen and hydrogen; isomerization in hydrocarbon cracking for gasoline octane improvement; hydrogenation for manufacture of edible fats and oils; selective oxidation for hydrocarbon derivatives; as well as hydrohalogenation for organic synthesis (read more: "Nanocatalysis: Applications in the chemical industry"). Nanocatalytical techniques are having a profound impact on clean energy research and development, ranging from hydrogen and liquid fuel production to clean combustion technologies (see: "Improved nanotechnology catalysts bring clean energy applications closer"). As catalytic reactions occur only when the reactants are adsorbed onto a working metal nanoparticle surface, a higher catalytic activity can be achieved by increasing the surface area of the active phase of the catalysts through reducing the size of the corresponding catalytic particles. Consequently, how to disperse the metal nanoparticles with tunable size, high density, and good thermal stability is a great challenge. New work by an international team of researchers provides not only new insights into the chemical evolution of monodisperse nanoparticles from an atomic metal-dispersed precursor, but also a general route to obtain tunable nanoparticles as heterogeneous catalysts for chemical and material production. The researchers from Tsinghua University in Beijing; Institute of Metal Research, Chinese Academy of Sciences, in Shenyang; Fritz Haber Institute of the Max Planck Society in Berlin; and Technical University of Denmark in Roskilde; have published their study on using an atomic metal-dispersed precursor of layered double hydroxides (LDHs) for high density, monodisperse metal nanoparticles in the February 14, 2014 edition of Journal of Materials Chemistry A ("Monodisperse embedded nanoparticles derived from an atomic metal-dispersed precursor of layered double hydroxide for architectured carbon nanotube formation"). The monodisperse metal nanoparticles obtained in this work are with tunable high density ranging from 1013 to 1016 m-2 and excellent thermal stability at a very high temperature of 900°C. "LDH is a class of synthetic two-dimensional nanostructured anionic clays consisting of positively charged layers and charge-balancing interlayer anions," explains Fei Wei, a professor at the Beijing Key Laboratory of Green Chemical Reaction Engineering and Technology. "Most metals, such as Fe, Co, Ni, and Cu, can be well dispersed in the framework of LDHs at an atomic scale with controllable components. In fact, LDHs are among the most important catalytic materials as a multifunctional catalyst and/or a precursor for metal-supported catalysts." "We tried to understand the evolution of ultra-dispersed embedded metal nanoparticles from LDHs by both in situ and ex situ methods," Qiang Zhang, an Associate Professor in the Department of Chemical Engineering at Tsinghua University, tells Nanowerk. "We selected the Fe/Mg/Al containing LDHs as the model sample for Fe nanoparticle formation." The team investigated this process by in situ X-ray diffraction together with thermogravimetric analysis, temperature programmed reduction, and high resolution transmission electron microscopy. They found that large quantities of mesopores induced by the Kirkendall effect were formed on the as-calcined layered double oxide (LDO) flakes. However, the flake morphology was well preserved at a very high temperature of 900°C. As Dang Sheng Su from the Fritz Haber Institute of the Max Planck Society notes, "the oxygen atoms bonded with Fe3+ cations were easy to be extracted at a temperature higher than 750°C, which greatly increased the mobility of Fe. The coalescence of the reduced Fe atoms into large nanoparticles enhanced the Kirkendall effect, leading to the formation of monodisperse embedded Fe nanoparticles on the porous LDO flakes." The researchers demonstrated that the areal density of the as-prepared Fe nanoparticles (with a size of 1-20 nm) on LDOs can be well mediated ranging from 0.039 to 2.1 ? 1015 m-2 by adjusting the Fe content in the LDH precursors, the reduction time and the temperature. The team selected carbon nanotube (CNT) growth as the probe reaction to evaluate the catalytic performance of the monodisperse metal nanoparticles catalysts. 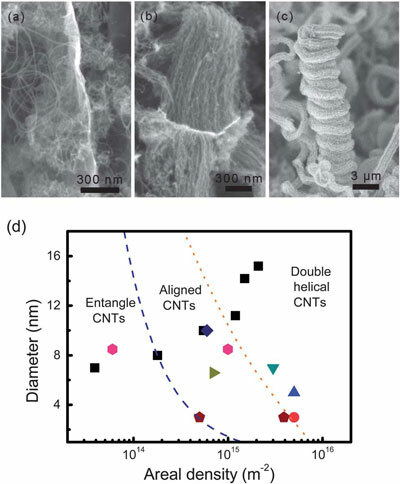 "Growth of CNTs can be directly correlated with the metal nanoparticles catalysts and we found that our as-obtained metal nanoparticles were with ultra-high density and exhibited extraordinary catalytic performance for the formation of CNT architectures," says Zhang. During their experiments, the scientists recorded the growth history and analyzed it to reach conclusions about the stages and results of CNT growth during routine chemical vapor deposition (CVD). For instance, when the density of Fe nanoparticles is low, only entangled CNTs were obtained; aligned CNTs required a large catalyst density. As professors Zhang, Su, and Wei point out, this work provides not only new insights on the chemical evolution of monodisperse nanoparticles from an atomic metal-dispersed precursor, but also a general route to obtain tunable nanoparticles as heterogeneous catalysts for chemical and material production. In the future, the researchers hope to precisely control the ultra-uniform metal nanoparticles formation through the chemical interaction of metal and support during the facile reduction process. 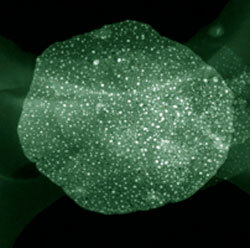 "More precise control can be achieved by mediating the Kirkendall diffusion and chemical reduction," says Zhang. "The ultimate goal is to achieve customized metal nanoparticles easily and accurately for nanocatalysis and energy conversion."